Why Choose Australia’s Favourite Air? Fujitsu is Australia’s leading supplier of air conditioning systems, with a portfolio to suit both residential and commercial applications. As well as producing the most efficient, market leading products possible we offer a comprehensive service network with offices and warehouses in all major capital cities across the country. Fujitsu also enjoys giving back to the community. We provide Patron sponsorship of the Sporting Chance Cancer Foundation as well as sponsorship’s to many sporting teams across the country, including being the Co-Major sponsors of the Essendon Bombers and South Sydney Rabbitohs. That’s why we are proud to say we are ‘Australia’s Favourite Air ’. Ducted air conditioning is usually a whole home solution that allows you to condition multiple rooms or the entire house using just one system. The indoor unit is usually located in the ceiling or under the floor, the outdoor unit in a suitable location outside the home. Conditioned air is circulated via a network of ducts in your ceiling or floor cavity, with outlets in as many or as few rooms as you wish. The temperature and hours of operation are controlled by a simple and easy to use control panel. All Fujitsu ducted air conditioners are reverse cycle, meaning they can keep you warm in winter and cool in summer. 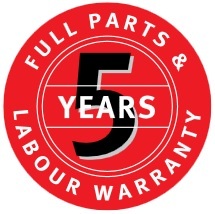 warranty across the entire domestic range. Hand in hand with our quality installation, you can rest assure that your investment will be to the standard you desire, our trained professionals ensure that all work is above and beyond your expectations leave you with a clean site.